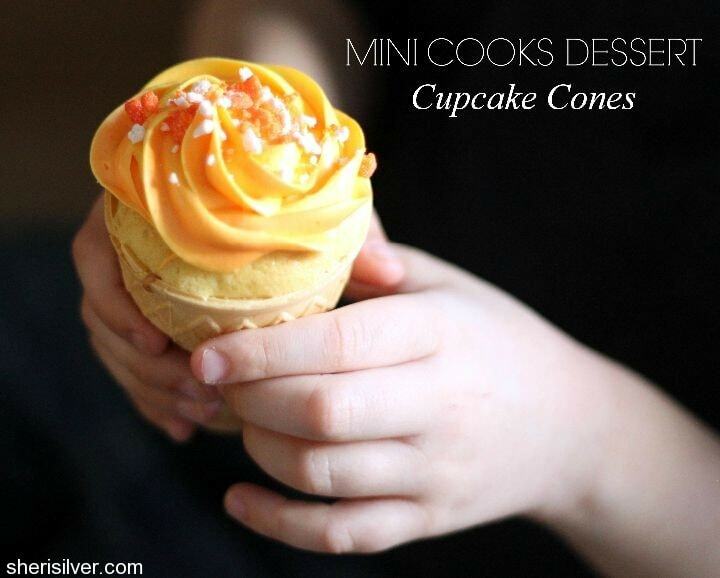 "mini cooks" dessert - cupcake cones! 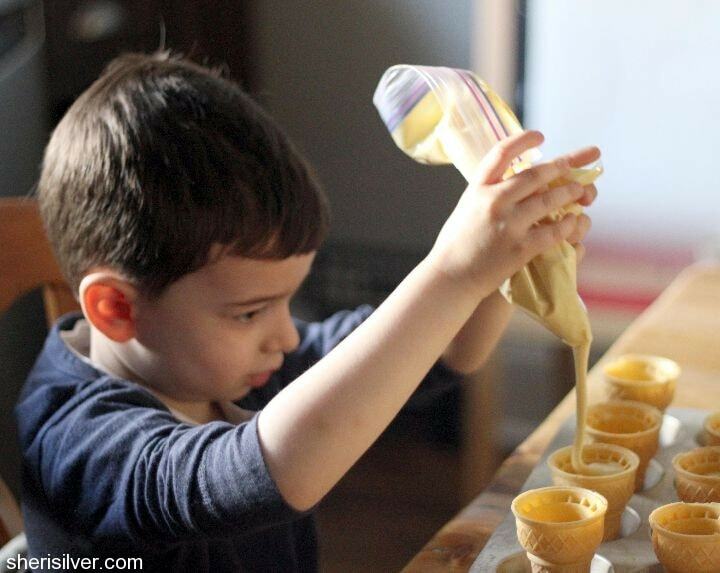 “mini cooks” dessert – cupcake cones! I was so excited to be tasked with dessert, to conclude this series with MJ and Joy. And not only because I love to bake, but because I’ve been waiting for just the right time to share this beloved treat with you all. I’ve been making cupcake cones – no joke – for over 20 years. They have been a staple of my children’s classroom parties since they were in pre-school, and I am over the moon to be making them again. Noah has already made several batches in his little life, and he knew just what to do when I told him we were making them this week. Cupcake cones are an adorable, no-mess way to serve traditional cupcakes, and work as well with a boxed mix as “from scratch”. And they so beautifully exemplify the spirit of cooking and baking with your kids – specifically, that it should be FUN. So if you’re not a “baker”, use the boxed mix and canned frosting. It’s all about working together to create something special, and if that’s going to help you get there, then go for it. Sometimes you just want to cut right to the fun part, and especially with young children or kids who are not enthusiastic cooks, a mix is just the ticket. This is truly one of those recipes that allow for endless variations, and will always be a hit. Pre-heat oven according to the recipe/box directions. 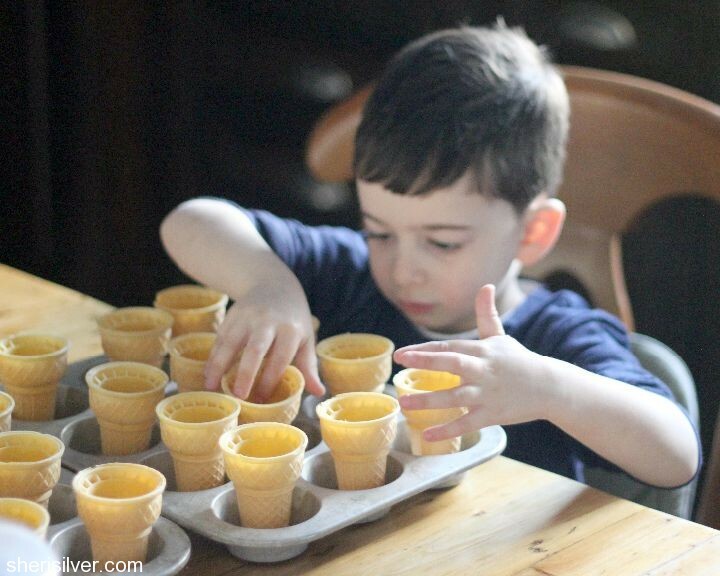 Place the cones in the bottoms of the muffin tins. Bake cupcakes according to directions. Cool completely before frosting. Fit your pastry bag with the piping tip; fill the bag with frosting (alternatively, you can use a ziploc bag, and snip an opening in the corner). To get the swirled effect shown here, divide the frosting between two bowls. Color each half with your desired shades, stirring thoroughly. Spoon the frosting into the piping bag, alternating between the two colors. Frost cupcakes and decorate with sprinkles/decors. Refrigerate till ready to serve (for easy transport to school, use this clever “cupcake carrier“!). *this idea is courtesy of the book “Hello Cupcake“, and it’s a game-changer – the easiest, neatest way to fill cupcake liners that I’ve ever seen. 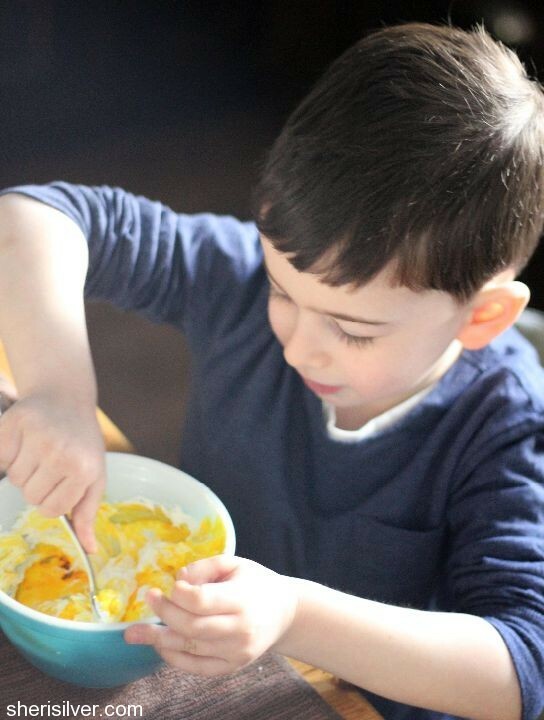 And don’t forget to check out our Pinterest board, for more great ideas for cooking with your little ones! 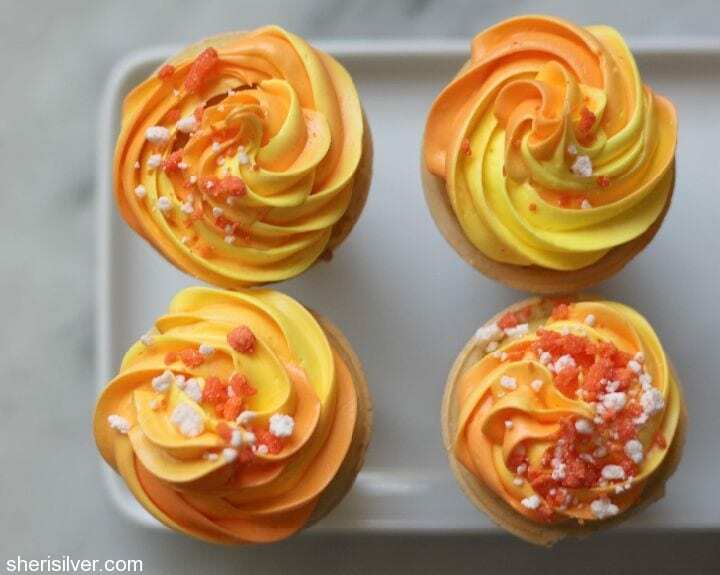 Love cupcake cones but have never made them – now I need to have a summer party! Love this! 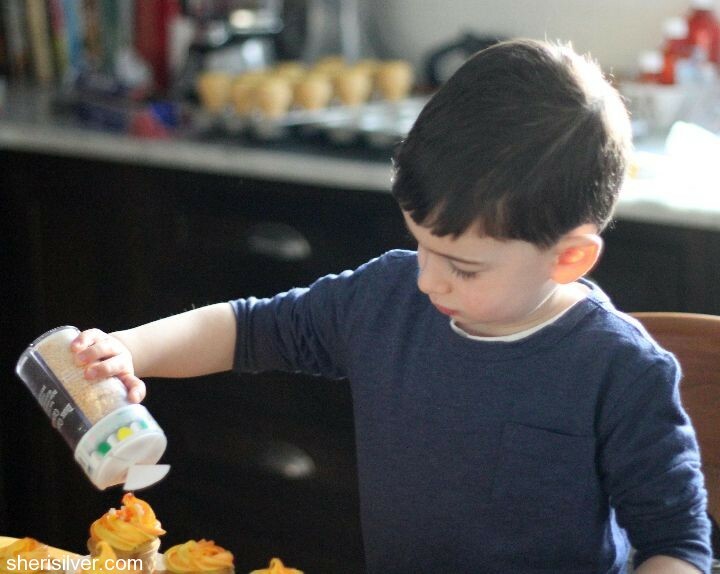 Maybe Noah can teach me the frosting part. They are gorgeous! Sheri! What an amazing photographer you are!! Whoa.